It’s hard to believe that five years ago I made a call that every business needs to be active in creating their own content, and that a blog was no longer a choice. Since then, the idea that a business should have a blog has become almost trite. The power of blogging is not virtually undeniable. Marketers who have prioritized blogging are 13x more likely to enjoy positive ROI on their efforts. More than 45% of marketers cite Inbound as their primary source of leads, versus 22% for outbound. 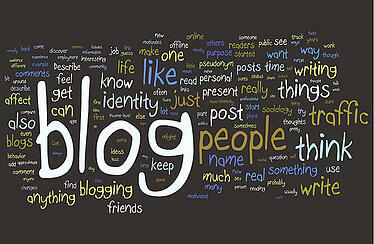 Blogging, of course, is a key element of Inbound Marketing. Yet when I review the lead generartion efforts of small and mid-sized B2B companies (and I review a lot of them), blogging is still not getting the attention that it deserves. While many of these businesses “have a blog”, their blogs are clearly afterthoughts, with no clear strategy or consistency to the posts that are made. When I talk with executives they often share the same two concerns. They worry about the time commitment that blogging requires, and they and their team are simply not confident about their ability to write blogs that resonate and lead to action. I’ll share my advice on managing the time it takes to blog in a future post. Today, I’m going to share my approach to blogging and how I’ve been able to consistently write posts for almost 10 years that resonate, create action and drive measurable ROI. I still remember when I posted my first blog in August 2005. After a few months, my brother told me that he thought the posts were interesting, but he was curious if I’d be able to keep it up for more than a year. I’ve done so by following a simple formula. Before writing a post I consider four questions. While these days I find that I don’t actually have to sit down and physically answer each question before writing, I used to. And while it added a few minutes to the task of writing a post, it saved a lot of time when actually writing it, and I’m convinced it’s the recipe for the success of all of the content we’ve created at Imagine. The first thing I do is remind myself of who I’m writing this post for. For those regular readers of this blog, yes that means I start with my buyer personas. But, I don’t think about my personas in general. I always narrow it to a specific persona, and often a subset of that persona. The more content is focused on your personas, the more effective it will be. I’ve always said that Andy Rooney was the original (video) blogger. His pieces at the end of 60 Minutes were always interesting. The reason? He always had a clear take, and made no bones about it. So the next question I answer is what’s the point I’m trying to make here? A good point of view challenges your audience’s thinking. Great content almost always puts forth a point of view that someone can disagree with. What’s the One Thing I Want The Reader to Remember? What’s the One Thing I Want the Reader to Do? Business blogs should educate, but they don’t exist for that purpose alone. Business blogging is all about creating action. It’s a crucial tactic to growing your audience and the top of the funnel. 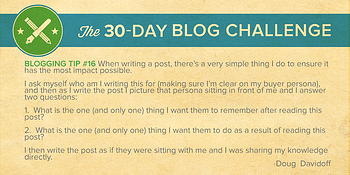 Once you’ve created that awareness, blogging is successful when it creates action. This is the biggest mistake I see in blogs everyday. The writer never clearly communicates what the reader should do. They leave it to the reader to figure it out. The best way to ensure that doesn’t happen is to start by figuring out what you want your reader to do. Just as I shared with the question above, you’ve got to be clear about what single action you want them to take. Communicating too many actions has the same effect as communicating nothing.